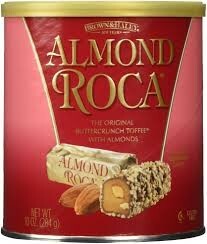 Almond Roca was invented in 1912 by Harry Brown and J. C. Haley, founders of Brown & Haley Company. approximately 63 pieces per pack. BUY DIRECT FROM FOOD DISTRIBUTOR & SAVE!! !